From Oscar-winning director David Frankel, “Collateral Beauty” is a thought-provoking drama that explores how even the deepest loss can reveal moments of beauty, and how the constants of love, time and death interlock in a life fully lived. 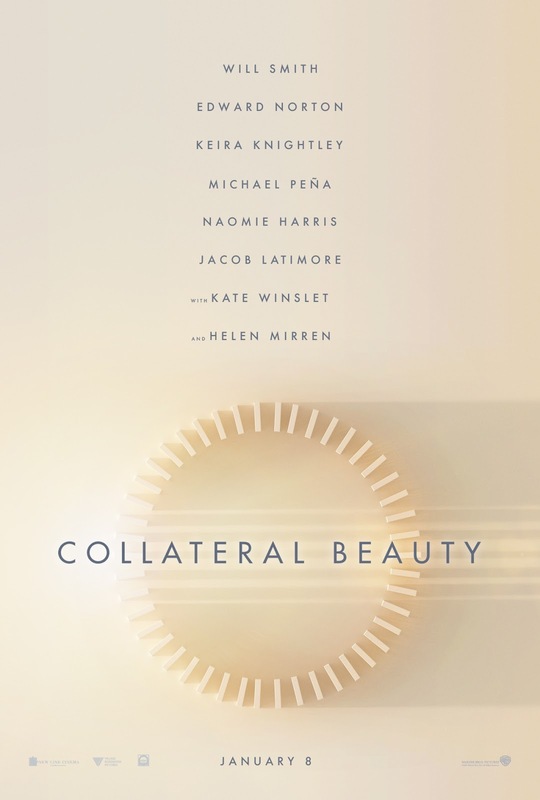 “Collateral Beauty” features an all-star cast, including Will Smith, Edward Norton, Keira Knightley, Michael Peña, Naomie Harris, Jacob Latimore with Oscar winners Kate Winslet and Helen Mirren. David Frankel (“Dear Diary,” “Marley & Me,” “The Devil Wears Prada”) directs from a screenplay written by Allan Loeb (“Wall Street: Money Never Sleeps,” “21”). The film is produced by Bard Dorros (“Triple 9”), Michael Sugar (Oscar-nominated Best Picture “Spotlight”), Allan Loeb, Anthony Bregman (“Foxcatcher”), and Kevin Frakes (“John Wick”). Serving as executive producers are Toby Emmerich, Richard Brener, Michael Disco, Michael Bederman, Peter Cron, and Bruce Berman. Frankel’s behind-the-scenes creative team includes director of photography Maryse Alberti (“Creed”), production designer Beth Mickle (“Whiskey Tango Foxtrot”), editor Andrew Marcus (“American Ultra”) and costume designer Leah Katznelson (“How to Be Single”). The music is composed by Theodore Shapiro (“Trumbo”). New Line Cinema presents, in association with Village Roadshow Pictures, an Anonymous Content/an Overbrook Entertainment Production, a PalmStar Media and Likely Story Production: “Collateral Beauty.” It will be distributed by Warner Bros. Pictures, a Warner Bros. Entertainment Company, and in select territories by Village Roadshow Pictures. Opening across the Philippines on January 8, 2017, “Collateral Beauty” is distributed by Warner Bros. Pictures, a Warner Bros. Entertainment company.